The short version: I love to paint. The longer version: When I paint I am absorbed into the process, time is weightless and my mind is engaged in the now. I work freely and intuitively in the moment, leaving behind angst to just enjoy the creative process. There's something about the brush strokes on canvas that is therapeutic to me. I dream about brush strokes. I love color the way some people love chocolate. Bold, free brushwork and saturated color have become my trademark. 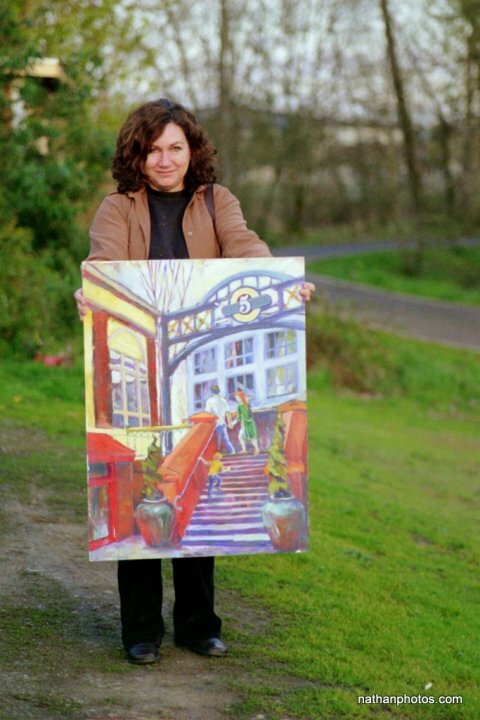 Painting, and particularly painting en plein air, makes me feel alive and happy. Making art is something I've loved since I was a young child, drawing compulsively on anything and everything I could get my hands on -- including, at the age of three, a large abstract masterpiece in crayon--on the living room wall! After that exercise in expressionism, my folks decided to get a huge blackboard, and it was there that my siblings and I spent hours and years honing our drawing skills. My parents helped foster this creative environment; we had no TV, and so spent most of our time in creative pursuits-- drawing, painting, music, making crafts and building tree forts. 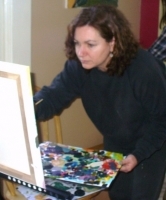 After some college pursuits in the arts and painting with oils, the fine arts took a back burner, during which time my husband and I raised 4 children. But art was still on the burner; I took classes and workshops over the years to grow in my skills. My artistic sense and compulsion to create and design found one outlet in the form of remodeling and landscaping our homes for many years. Also, music---playing, writing, performing, recording, and teaching it—became my passion. The fine arts were brought back onto the front burner about seven years ago in the form of pastels and later with acrylics. My husband and I were visiting wineries and galleries in California, and I was so taken by the artwork that I was compelled to come home, dust off my art supplies and jump-start the painting again. The rediscovery of painting brought fresh joy and quelled my overactive brain. Since then I have been painting like there's no tomorrow. I make art because there is some innate, inexplicable desire that compels me to create and recreate what I see in nature, form, colors and shapes. If someone were to take away my paintbrushes, I would find something else to create with. Like water, creativity will find an outlet in some form or another. I think that each one of us is made to create in some way or another, because I believe that we are made in the image of our Creator. While much of art is subjective as far as a personal preference, I do hope my work reflects my love of God's creation and color-- and the pure joy of creativity. See truer copy under "cityscapes"